Bhubaneshwar, March 24: The Biju Janata Dal (BJD) on Sunday announced the second list of candidates for assembly elections in Odisha. The announcement was made by BJD supremo and Odisha Chief Minister Naveen Patnaik. The party announced the names of nine candidates for upcoming elections in the state. The party has re-fielded its sitting MLA Raseswari Panigrahi from Sambalpur constituency while Pradeep Behera will contest from Loisinga. In the forthcoming polls in Odisha, Kishore Mohanty will contest from Brajaraj Nagar, AN Singh from Bolangir, Pitam Padhi from Pottangi, PK Dishari from Lanjigarh, PC Majhi from Jharigam, Mukunda Sodi from Malkangiri, Dr R Panigrahi from Sambalpur and Rohit Pujari is fielded from Rairakhol constituency. 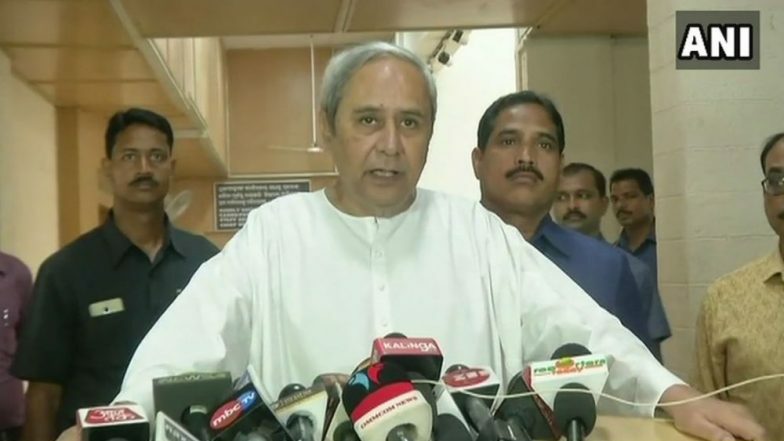 Odisha Lok Sabha, Assembly Elections 2019: BJD Announces First List of Candidates; Naveen Patnaik to Contest From Hinjili & Bijepur Assembly Seats. Earlier today, Patnaik claimed that BJD will win all 21 seats in Odisha and play a major role in forming the government at the centre. "No national party will be able to win a majority in Lok Sabha election this time. BJD will have a decisive role to play in the formation of the next government at the Centre," he said at a rally in Nayagarh. Odisha has 21 Lok Sabha seats and 147 Assembly constituencies, which will have simultaneous Lok Sabha and Assembly election in four phases beginning from April 11.